Well how lazy am I!?! I’ll get my excuses in- really busy at work and getting in late etc etc etc. But I have been keeping a log of what we have been having for dinner so I will do a recap now. Quite a relaxing dinner of some bought in ravioli and a spicy tomato sauce. It was ok, but Colin left most of it and that was because I put way too much chilli in! Who would believe it, it’s normally Colin who goes mad with the chilli. But the ravioli men were good- a spicy sausage and tomato mixture inside some really light little parcels. A good late night dinner. Late night for me so no dinner. Colin had some chilli. 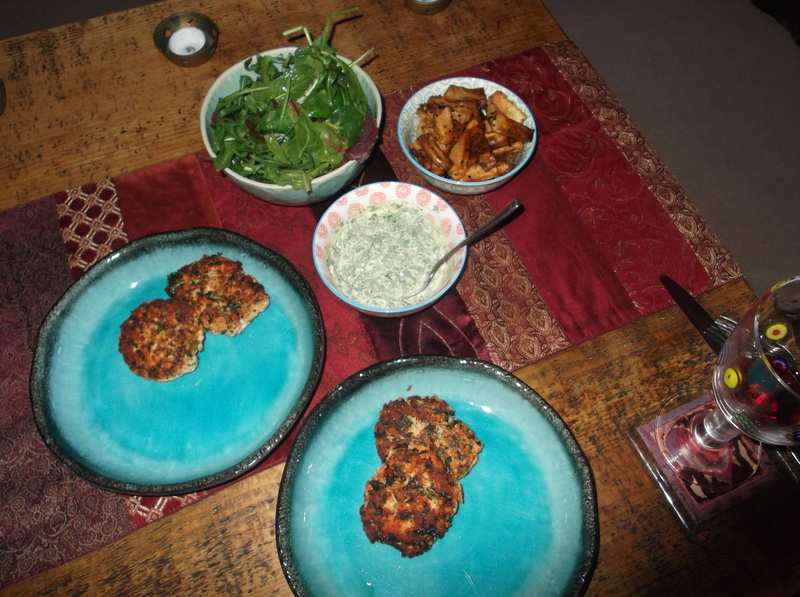 Tonight I thought I’d try a recipe from a fairly new cookbook ‘Mighty Spice’ by John Gregory-Smith. The picture, which is not a great one I have to admit, is at the top of post! However it was absolutely delicious, light, fragrant, full of flavour and now a firm favourite. Here’s the recipe. Put all of the chutney ingredients into a food processor and blitz until a smooth paste. Put the salmon, coriander, chilli, garam masala, ground coriander and a pinch of salt into the processor and pulse until just combined. Cover with cling film and chill out in the fridge for 30mins. Divide the salmon mixture into 4 portions and shape into burger type shapes. Heat some oil and fry the salmon really lightly until browned and cooked through. Serve with the chutney on the side and some rice and salad. This was really delicious, I can not recommend it enough. Marie you will love this !!! Late night again so no dinner and more chilli for Colin! Tonight I made a recipe from my new Lindsey Bareham cookbook. Basically it was a mini roast without all the hassle! I seasoned a chicken breast well and sliced it into slim pieces. I griddled these slices hot and brief just before eating. Along side this were some potato- well actually some premade gnocchi, boiled only for 1 min and then fried with some garlic and a little chopped bacon lardons. I had seen this gnocchi type of thing in books before and fancied giving it a try,, and it was ok, quite good infact, but if I did it again I would fry the gnocchi for less time more hot to ensure all of them were very crispy. Out at my AGM tonight, one of the hottest chillis I’ve ever tasted and some good burgers served on the roof of my branch, served by cowboys (and girls)!! !